“Slow down, you move too fast…” sang Simon and Garfunkel rather a long time ago. The Spirit has been whispering a similar refrain to me recently. I know it’s become a cliché but the pace of modern life is extraordinary. Instant communication around the world, homes full of the latest technology, 24-7 everything. Perhaps that’s why I like gardening so much because you have to slow down and go at nature’s pace for once, with lots of patient waiting for things to happen. When we’re going too fast our spiritual well-being is jeopardised by a shallow engagement with the “unforced rhythms of grace” (Matthew 11:29 The Message). We lose the ability to still our hearts and minds and fully encounter God’s presence (Psalm 46:10). We fail to heed the gentle whisper of the Lover of our souls (1 Kings 19:12). Now, at this point I don’t want to get into a theological discussion about the nature of sin. But I think there is a lot of truth in that statement. Our failure to pay attention to God, and our failure to pay attention to our neighbour, will stifle our ability to follow the two greatest commandments. And the more we rush through life, filling our days with activity, the harder it is to really pay attention. 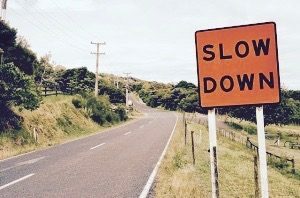 To grow in our ability to hear God’s voice, and to develop a God-conscious existence, we have to take on the discipline of slowing down a bit. I know in my own life that I have many days when I’m rushing too much from activity to activity, and it’s only when I get to bedtime that I realise that I haven’t heard God that day. And it’s not because God isn’t speaking. I’ve just been too busy and unfocused to pay attention to what he’s saying to me. I recognise that for most of us this is a real challenge. But how tragic if the reality of our lives is that we don’t have time to listen to God. What are we missing because we’re not paying attention? Most of the time God speaks in whispers. The Holy Spirit doesn’t tend to shout revelation; rather he chooses to speak in the still, small voice and in fleeting impressions. He speaks in the kind of voice where we have to lean in, get close, and pay attention. It’s the voice of the tender Father rather than a sergeant major. A voice that is easy to miss if we’re going too fast. But if we slow down enough we find a voice of clarity, kindness and breathtaking beauty. In John 10 we are presented with a simple yet profound picture of how our relationship with Jesus is supposed to work. It’s not complicated: he is our Good Shepherd and we are his precious sheep. We know – and listen to – his voice, and we follow him. This imagery of a shepherd with his sheep reminds us that following Jesus should fundamentally be about a simplicity of lifestyle and a gentle pace: sheep don’t tend to be manically busy. And to properly tune in to God’s voice we need to choose a mindset of abundance rather than scarcity – that it’s really worth slowing down to listen – because there is so much God wants to show us. We should remind ourselves every day that the Kingdom is indeed at hand, that the Holy Spirit has very much been poured out upon us, that the spiritual realm is in fact the superior reality. To really grow in the prophetic – to grow in our ability to hear and see things of the Spirit – we have to slow down. We have to embrace a lifestyle of going slow enough to hear, of re-ordering our priorities, of staying attuned and in synch. I’ll finish with a few simple suggestions of how we can begin to break the habit of going too fast. Why don’t you choose one of these and have a go over the next few days? Put some reminders on your phone throughout the day to stop for a couple of minutes and engage with God’s loving presence. Welcome the Holy Spirit and ask him to show you what he’s doing in the world around you. Find 10 minutes every day to connect with God through nature and to marvel at the wonder of his creation. For example, time in your garden or a local park; looking at the stars; getting out into the countryside. Do something that intentionally slows you down, like walking to work one day a week, and use that time to pray through the Lord’s Prayer or pray in tongues. When you arrive somewhere by car, spend 2 minutes sitting in stillness and listening before you get out and get on with your day. Go to your favourite coffee shop and enjoy Jesus’ presence as you read your Bible.